These parts fit the Brinkmann Model 810-8533-S Heavy Duty Gas Grill. 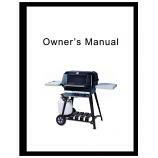 Also called the Pro Series 8533, this gas grill has four main burners, a side burner and a rotisserie burner. It uses dual-fuel valves and is compatible with a conversion kit. However, that conversion kit is no longer available from Brinkmann.